MGM Mirage today reported the second death of a dolphin this year at The Mirage's dolphin habitat. Two-year-old Sgt. Pepper died Wednesday of complications from a lung infection, MGM Mirage spokeswoman Yvette Monet said. Sgt. 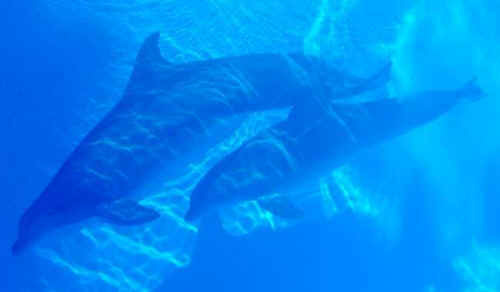 Pepper (right) swims with his mother Dutchess in September 2008 at the Siegfried & Roy’s Secret Garden and Dolphin Habitat. Monet said The Mirage’s animal care staff and veterinarians had been treating Sgt. Pepper for the lung infection for months after he was diagnosed in December 2008. A necropsy will be performed to determine further information on his death. The Mirage’s dolphin habitat now has five dolphins: Dutchess, Lighting, Huf n Puf, Maverick and 9-month-old Bella. Lisa Wathne, captive exotic animal specialist with People for the Ethical Treatment of Animals, said the animal protection organization will file a formal request to investigate the latest dolphin death. The U.S. Department of Agriculture issues permits to such facilities allowing them to operate. "We will ask the USDA to investigate, absolutely," Wathne said. Sgt. Pepper is the 14th dolphin to die at the Siegfried & Roy's Secret Garden and Dolphin Habitat since the attraction opened in 1990. Five of the 14 dolphins were stillborns or died shortly after birth. The last dolphin death at the habitat was in July 2008. The death of 11-year-old Sage was undetermined after an investigation by the Department of Agriculture's animal care division. For information about dolphins in captivity and how to end it, visit The Dolphin Project.